Matt's love of Scandinavian design has certainly influenced my own design sensibilities. I find myself more and more drawn to the clean lines and simple forms signature in modern design. 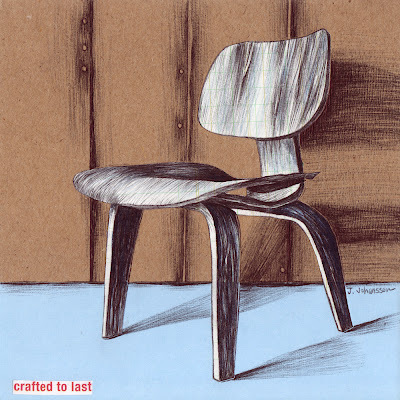 My latest piece features the mid-century modern classic Eames Molded Plywood Chair. Designed in the 1940's by husband and wife team Charles and Ray Eames, this innovative design still looks fresh and modern today. "Crafted to Last" measures just 6" x 6" and was created with paper, adhesive and a good ole Bic pen. This one of a kind work is mounted on a 1.5" deep cradled wooden box and comes ready to hang. It is finished with a protective UVA/UVB coating, so that the papers and ink won't fade over time. "Crafted to Last" is available for sale in my Etsy shoppe. Stay tuned for my Eames chair varietals soon!